We’ve been anxiously awaiting HBO’s Westworld for what feels like forever. 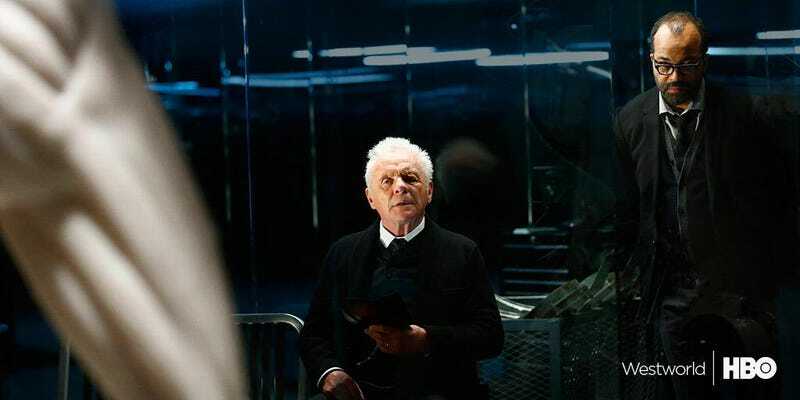 Originally, we hoped Westworld would arrive in 2015, then we heard 2016. And then production was shut down, and we heard it might be 2017 instead. What’s going on? We talked to showrunner Jonathan Nolan, and he filled us in. We were talking to Nolan for an interview about the new season of Person of Interest, and we’ll be running that stuff in the next couple days. But while we had Nolan on the phone, we had to ask about his update of Michael Crichton’s famous “robot theme park gone wrong” story. After all, Westworld is one of our most anticipated projects, thanks to a brilliant cast (Ed Harris! Anthony Hopkins! Thandie Newton!) and Nolan’s incredible pedigree, including the way he reinvented the A.I. narrative with Person of Interest. What was behind Westworld’s production shutdown? And is it true that the show needed to be recalibrated in order to get it back on track? Everything is apparently back on track, and they’re in the final two weeks of shooting as you read this. “This was strictly a question of our ability to write, produce and direct,” Nolan added. “We came out of the gate very, very, quickly, because we wanted to get on the air as early as possible, and so we started shooting with only a handful of episodes in hand,” explained Nolan. And he soon discovered that this was a much crazier undertaking than anything else he’d been involved with—even the Batman films or Interstellar. Coming off Person of Interest’s intense production schedule, Nolan expected to be able to write, shoot, produce and cut episodes simultaneously. “I got used to it on Person of Interest,” Nolan said. The turnaround time for a procedural show on CBS is brutal, and Nolan was confident that experience would allow him to put together episodes of Westworld quickly. But he soon discovered that Westworld is a very different beast than Person of Interest. Meanwhile, though, some shows are more difficult to produce than others. Nolan praised the incredible group of writers they got to work on Westworld (who include Charles Yu, author of Sorry Please Thank You.) He said J.J. Abrams, who set the whole project in motion by reaching out to him and Joy about Westworld years ago, is not heavily involved at this point. According to Nolan, that’s just because “he’s a very busy dude.” Nolan is directing the season finale right now, while Michelle MacLaren is directing the penultimate episode. “We’re shooting some pretty cool stuff,” said Nolan. And Nolan basically said the most frustrating thing about Westworld wasn’t the logistical challenges, but reading about it on the internet.